The threatening strategies of Rome, Naples, Sicily, the Order, the Curia and the Inquisition in 18th-century Malta are well documented in their respective archives. Tracing in their midst the incisive manoeuvres of a rebel lawyer bolstered by his appointed role as the grandmaster’s chief minister for justice amounts to disputes, power mongering and Enlightened tremors, menacing the serenity of the respective supremacies. 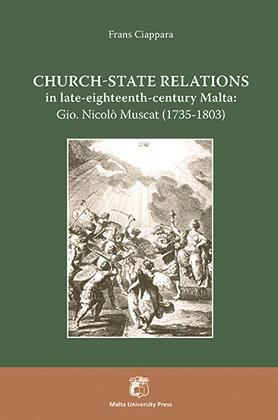 This is what historian Frans Ciappara, supported by copious archival sources in Malta, Naples and the Vatican, effectively proposes between the covers of a stimulating account, propelling in the process, his endorsement of Nicolò Muscat’s efforts to a shortlived mission at attempting to introduce a measure of secularisation in Malta mostly between 1786 and 1793. Following his earlier shorter publication on Muscat in 1993, Ciappara could be considered as the authoritative historiographer on this controversial ‘modern philosopher of Malta’, as a contemporary cardinal of the Church had described Muscat when validating the Inquisitor’s condemnation of ‘enlightened’ local thinkers. Others, as the author himself concedes in his concluding paragraph, would condemn Muscat’s episodic achievements, some even going as far as labelling Muscat “an abject flatterer” of his “weak” patron, Grand Master de Rohan, in his readiness “to ingratiate himself with the powerful”. Before starting to track his hero, Ciappara generously sets the backdrop of the scene in Europe by quoting the Gallican Church’s declaration (1682), wherein “kings and sovereigns are not, by God’s command, subordinate to any ecclesiastical power in secular matters”. Towards the concluding quarter of the 18th century this maxim was realised, albeit lamentably for the ancien régime, beyond philosophising and litigation. The French Revolution banished both the nobility and ecclesiastical structures, appropriating the Order’s income from their commanderies in France and elsewhere. After a brief insight into Muscat’s early years, Ciappara catches up with the lawyer when he is appointed to the all-powerful position of uditore. The uditori administered the Maltese principality on behalf of the grandmaster, whom they continuously counselled on the affairs of their countrymen. Muscat was de Rohan’s favourite uditore and avvocato generale del principato, virtually ranking as the chief minister. Ciappara believes that Muscat, possessing “energy, self-assurance, administrative ability and great moral and intellectual power”, imposed his personality on the last years of the government of the Order on the Island. The author credits the man with “the outstanding quality” of being able “to clearly and directly claim for the State the right to safeguard its position” definitely against clerical institutions. Muscat was convinced that the Church had encroached on the governmental sphere and, conscious of his influence in the political context, was determined to reinforce the position of his gracious prince, strengthening his own in the process. Muscat’s supreme test came when de Rohan invited a Neapolitan lawyer to scrutinise the Maltese judicial system. The lawyer, Giandonato Rogadeo, wrote an invective report listing the main defects of the system, apparent abuses of the uditori, accusing them of corruption and, above all, he denigrated the Maltese nation. In 1783, with Rogadeo back in Naples, Muscat, who was called ‘a blockhead adorned with a shady office’, grabbed the opportunity to pen a contemptuous response entitled Apologia a favore dell’Incita Nazione Maltese (Rome, 1783) wherein he showered “unbounded praise” on Malta, “a civilised European nation” and defended the uditori. This is not the only public dispute Muscat wielded in his controversial career. With the Holy See often accusing him of ‘malignant and false’ manoeuvres he was sacked and re-appointed to his post three times until the grandmaster had no other alternative but to part with him irreversibly. Ciappara endorses Muscat’s “unflagging and furious industry”, describing him as “armed with high ideals” of the legal profession. The author makes the case for Muscat’s great national importance, consuming interest and steadfast determination in the conviction that “Malta should not be reduced to the status of a province of Rome”. This is the second Maltese enlightened reformer that Ciappara profiled, the other being Mikiel Anton Vassalli (2014), whom he had championed as “the developer of a national consciousness:, a “giant individual, who displayed remarkable courage and daring, a brilliant mind and a great heart”. Both have contributed to the nation’s identity and self-realisation, though it appears that what they meant by Nation differs in the manifestation of their actions. I am certain this well-researched volume will throw more light on the nation’s nascent energy and may feed further discussion on the complex subject of patriotism.